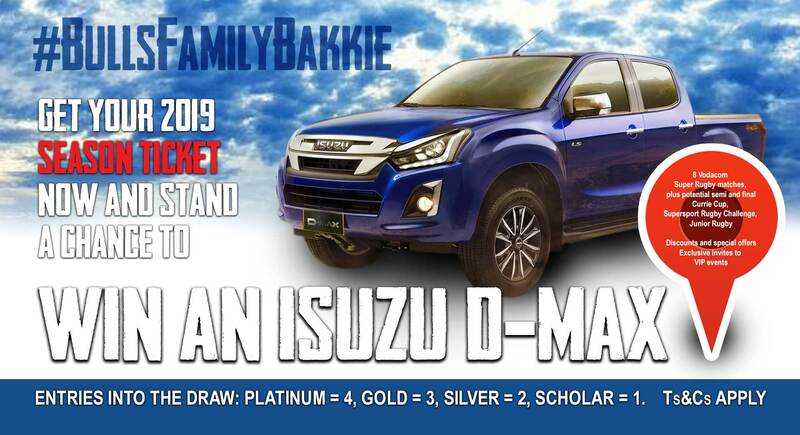 The opportunity to go into the draw to win a top of the range Isuzu D-MAX double cab. A PLATINUM ticket will get your 4 entries, while a GOLD ticket gets you 3, a SILVER 2, and a SCHOLAR ticket just 1. Ts&Cs apply. Exclusive fares on British Airways operated by Comair (T&Cs). 10% off on all food and drinks at Trademarx. Further discounts on the purchase of additional tickets. Limited edition Season Ticket Holder cap. Invites to selected exclusive VIP events with members of the team and many more partners discounts. Renew and pay before 21 December 2018 and receive an early bird discount of 10% off. Preferential sales for parking per tournament will be available directly from the ticket office. 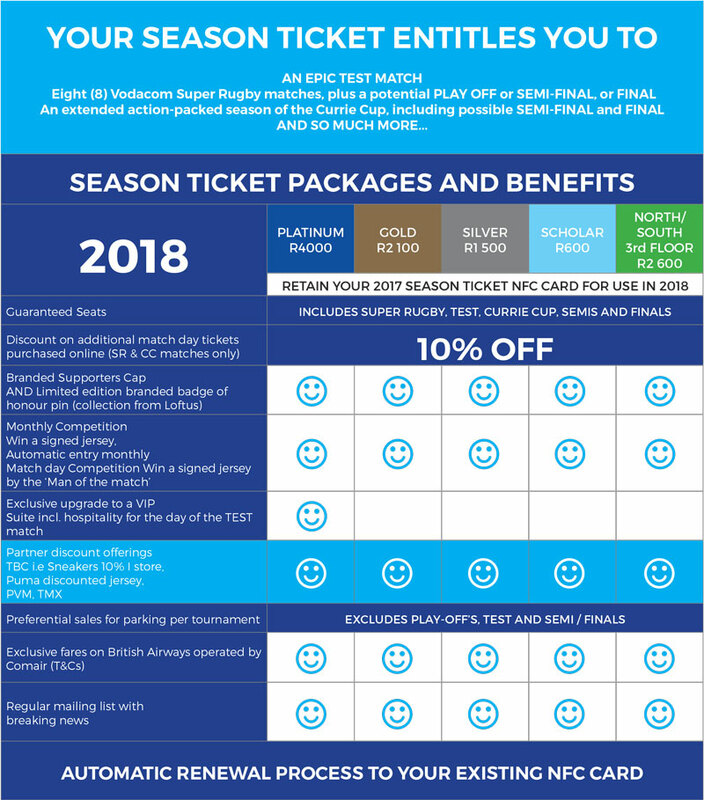 Once renewed, access to matches for the 2019 rugby season at Loftus Versfeld will be automatically loaded onto your NFC season ticket card (NFC card looks similar to a plastic bank card). You will not be required to physically bring your card into the ticket office for a manual uploading process. All other packages: include ALL rugby matches played at Loftus Versfeld in the 2019 season, including possible semi`s and finals and a test. Gold Package: R2100: Grand Stand, Blocks A, B, C, D, F, G, H, J, K, L, M, N, O3, P, Q, R and S. East Stand Lower Under Cover, Blocks NN, OO and PP. Silver Package – R1500: East Lower Stand, Block LL, MM, NN, OO, PP, QQ and RR. Scholar package – R600: North Lower Stand. Online on Ticketpro by credit card or EFT to Payfast (please use the correct reference as explained on the Ticketpro website) No Diners Club or American Express Cards – please refer to ticket office. Payments at the Loftus ticket office can be made by credit card (with or without the budget option or with an EFT into the Blue Bull Company`s account: Blue Bulls Company, ABSA Bank, Account number: 407 137 7820. Please e-mail proof of payment, with proper reference, to seasontickets@bluebull.co.za or fax to 0123441245. Where can I find the Loftus Versveld Fixtures? On the website www.thebulls.co.za go to Loftus Versveld/Stadium/Fixtures. What is the difference between the upper and lower section of the stadium? The lower section is closer to the action, whilst you have a better view from the upper section. Where the best place to sit is, depends on the individual’s preference. All seats at Loftus Versveld have a good & unrestricted view. How do the rows and numbering of seats work? The rows in each block start with row A in front – closest to the field.The numbering of rows starts on the West Stand Blocks A & L on the south side, up to the biggest number on the north isle, This continues clockwise throughout the stadium, e.g. North Stand, no.1 on the west side, East Stand, no. 1 on the north side and South Stand, no.1 on the east side. There are Big Screens in the middle of both the North and the South sides. Can I sit a child on my lap and not purchase a ticket for him? No, every human being entering the stadium, must have a ticket. What am I allowed to bring into the stadium? You are allowed to bring in food and drinks, but tins, bottles, glasses, hard cooler boxes, alcohol, fire arms, horns and fire crackers are not allowed. I have lost my NFC card or it has been stolen. How do I replace it? Bring a sworn affidavit or case number, with relevant details, to the Loftus ticket office. Replacement cards will be issued at R50.00 per card.